Today’s technological devices are smarter than ever. Gone are the days of carrying around a CD player, phone, and camera. Smartphones can do it all! Unfortunately, medical alert systems haven’t really joined the all-in-one bandwagon. A medical alert system is just a medical alert system, but that’s all about to change with GreatCall’s Lively Wearable. What is the Lively Wearable? The Lively Wearable is first and foremost a medical alert device. Like many others on the market, the pendant can be worn around the neck or on the wrist. It contains fall detection and has a button that can be pushed in an emergency situation. The Lively Wearable also allows you to connect directly with a customer service representative in the event of an emergency. One thing that sets the Lively Wearable apart from other medical alert pendants is its look. It has a sleek, modern appearance, especially when worn around the wrist. It looks more like a fitness tracker, or even an Apple Watch, than a medical alert device. It even comes in two color choices that include white and gold and gray and silver. What else does the Lively Wearable do? Most medical alert systems stop there, but the Lively Wearable is truly the first of its kind. Not only does it offer medical emergency assistance, it also offers fitness tracking and daily challenges. The Lively Wearable tracks your steps like a fitness tracker would, encouraging the wearer to enjoy an active lifestyle. Daily challenges are meant to keep the user’s mind and body healthy. Not only does the pendant make life easier for mom, it offers peace of mind to her family as well. You can stay connected to mom by getting updates on the steps she’s taken, daily challenges she’s completed, and you can rest assured that you’ll be notified immediately if the emergency button is pushed. What about the base unit? If you’re at all familiar with traditional medical alert systems, you know that in most cases a base unit is involved. With so many amazing features, you’d probably assume the same of the Lively Wearable. This is where the Lively Wearable is truly unique. It is the first medical wearable that offers activity tracking and nationwide mobile safety service via the user’s smartphone. In lieu of a traditional base unit, the smart device has Bluetooth capabilities, which means everything is tracked by your smartphone. That’s also how the device communicates with loved ones. There’s no need for a base unit because your smartphone acts as the base unit! This isn’t the first of GreatCall’s devices that doesn’t require a base unit. The medical alert system company also offers a Splash device that doesn’t require a base unit either. What else should I know about the Lively Wearable? The true value of a medical alert device is often in the details; details that are usually overlooked. The Lively Wearable is completely waterproof, so it can be worn in the shower. In addition, the device is able to connect you with highly trained agents that can communicate with you directly, just like you would expect from any medical alert pendant. Ready to buy the Lively Wearable? It is a really great device, but there are a few other things you need to be aware of. Currently, the device only works with Android 4.4 and newer. You can check online at greatcall.com/check if you’re not sure if your phone meets these requirements. Just make sure you check the website with your phone! It won’t work if you access it on your computer. Unfortunately, the Lively Wearable is not currently compatible with iPhones, but that will likely change in the near future. Like other medical alert pendants, the Lively Wearable does not need to be charged. However, because the device does a lot more than traditional pendants, the battery only lasts for about six months, requiring more frequent changes. In addition, the device will only connect to a smart phone within 150 feet. That means you’ll have to keep your smart phone near you at all times. You might expect such a high-tech device to cost more than other medical alert systems, but surprisingly, that’s not the case. 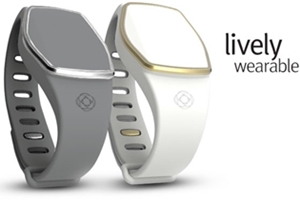 The Lively Wearable is regularly priced at $49.99, which is fairly affordable. However, right now the device is specially priced at just $37.49! You do have to pay for a monthly plan, but that’s affordable too at just $14.99 per month. Unfortunately, you will also have to pay for activation fees. If you’re trying to decide between GreatCall Splash and the Lively Wearable, make sure you check out our full Splash review. You can also check out all of the other amazing medical alert reviews to ensure you find the medical device that’s just right for you. This article really needs to mention that the Lively Wearable device does NOT contain a microphone and a speaker. According to the User Guide on the website, the voice communication is done using the smartphone itself. You CANNOT speak to customer service by speaking into the Lively Wearable device itself; you must have the phone close by so that you can use the phone to talk to someone. You cannot be 150 feet away from the phone and talk to the customer service person. Excellent point, ElderlyJC. Thank you very much for providing this helpful information. Bought this for my grandmother. Poor product and poor support. 8 days after activating her lively wearable she received a message that the battery was low, a day and a half later the battery was completely dead. The Lively wearable does not charge, it runs off a watch battery that is supposed to last 6 months, it lasted less than 10 days. My grandmother tried to call support who told her she needed to buy a new battery. I didn’t feel that was satisfactory so I called myself. After being forwarded to tech support I was told to take the battery out and rub it on a piece of clothing and put it back in, and if that didn’t work to call back later. I searched online for reviews and came across this site. I was completely unaware the he Lively Wearable does NOT contain a microphone and relies on the smart phone’s speakerphone to get help. This is not listed anywhere on the website other than inside the user guide, it is not mentioned on any of the product pages before you purchase the device. Why make something water proof? She can’t bring her smart phone with her in the shower. Honestly if she has to be in range of the microphone on her smart phone she pretty much has to have her smart phone on her person, so if that’s the case she could just as easily dial 911. Michele – We truly appreciate you taking the time to provide your experience with the Lively Wearable so other visitors to our website can make a much better informed decision on potentially purchasing this device. It seems the Lively Alert (not to be confused with the Lively Wearable) would be a good alternative. Our experience with GreatCall Customer Support has been very positive, but we believe in transparency, so thank you again for sharing your feedback.